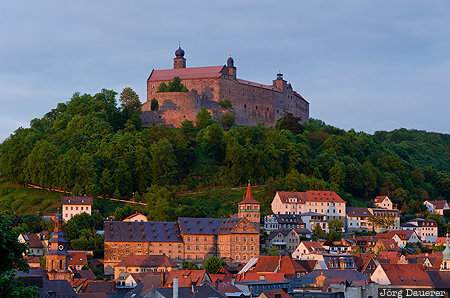 Castle Plassenburg above the city of Kulmbach illuminated by warm evening light. Kulmbach is in Upper Franconia (Oberfranken) in the north of Bavaria, Germany. This photo was taken in the evening of a cloudy day in May of 2014. This photo was taken with a digital camera.